"Dance is an incredible means for bringing people together and can truly be a powerful tool for social change," said Jess Davis, speaking of her involvement in Everybody Dance Now!, a national organization striving to transform the lives of youth through dance and leadership. Founded in 2005, Everybody Dance Now! was created out of the vision of then fifteen-year-old Jackie Rotman, who was inspired by her own dancing experiences to develop an organization that provides free dance programs through local chapters to youth who otherwise do not have access to them. As a life-long dancer herself, Jess became involved in the organization in 2009 when she was approached at a local Santa Barbara, California dance studio by Jackie who shared her story about how she founded Everybody Dance Now! "I had always known how transformational dance could be - but hearing about how Everybody Dance Now! really channeled a passion for dance to help others in the community is what inspired me most to get involved." Jess, along with six other students in the Santa Barbara community, began working closely with Jackie in 2009. Under this mentorship, Jess became actively involved in the organization as a faculty member and recently took on the role of Executive Director. "Everybody Dance Now! envisions a world where every kid - no matter their background or ability - can have access to creative and healthy outlets for dance. What struck me most about the organization is that it inspires young leaders who are passionate about something to look for ways to get involved in their own communities." 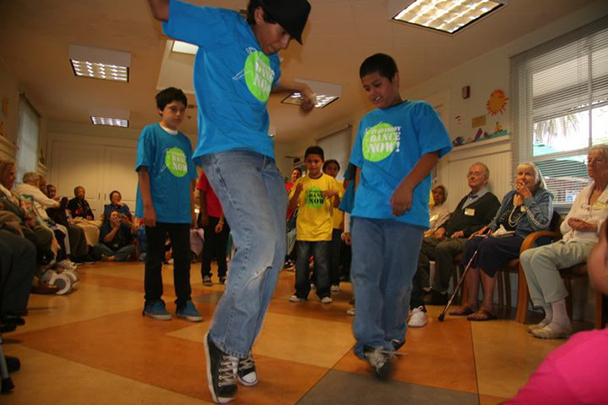 Blossoming into a full-fledged national nonprofit organization, Everybody Dance Now! now has ten chapters in cities nationwide, serving nearly 400 youth annually. In addition to providing free access to dance programs to help all kids reach their full potential, the organization reaches out to low-income, at-risk schools to facilitate teachers to instruct their own local dance classes. "We really value reciprocity and one of our goals is that kids take our dance classes, interact with other students and eventually spread the message of Everybody Dance Now! by giving back in their own communities." For the members of Everybody Dance Now!, dance is much more than a hobby. "Dance is something that can really connect people and promote confidence. All of the students we work with have unique stories to tell about how dance has played a role in their lives, whether it's gaining self-confidence or having newfound access to physical activity." As Everybody Dance Now! enters into its seventh year, Jess is excited for the organization to continue expanding nationally and provide access to dance to more children and young adults. "We are trying to change lives through dance and it's my dream that Everybody Dance Now! finds itself all over the world at some point in the future." Through her involvement with Everybody Dance Now!, Jess hopes to continue to serve as a role model for other young people looking to make an impact. "Working in a youth-led organization, I've come to realize that sometimes adults will underestimate you. This always made me look at my age as a barrier. Young people are often told, ‘You're going to do great things when you're older.' But we have the ability to be leaders today. That's what I want to tell other young people. Never see your age as a barrier - see it as a benefit."